Lactate Threshold training training involves continuous training at, or around, the speed/power output at which the lactate threshold occurs. In untrained individuals this typically occurs at around 50 – 60 %VO2max (around 55-65%HRmax), however in trained athletes this can increase significantly to around 75 and 85 % VO2max (around 80-90%HRmax). For most people the lactate threshold corresponds with an intensity that can be sustained for around 30-60 minutes although this can vary between individuals. For distance runners this would equate to approximately 10k-10mile race pace and for cyclists this would equate to a pace that could be sustained for approximately 30-40km. Elite athletes will often have their lactate threshold determined during an incremental exercise test, and the corresponding speed, heart rate or power output, can be used to ensure Lactate threshold training is kept within limits that correspond with the lactate threshold. If like most people you don’t have access to a sports science laboratory, you can gain an idea of your lactate threshold by completing a 30 minute time trial, and recording your heart rate, speed, or power output throughout the time trial – for best results, this should be in a non-competitive situation, as heart rate tends to be significantly higher in race situations, and therefore replicating those heart rates in training, would result in a training intensity that is above the lactate threshold. You can find more information on the lactate threshold and estimating the lactate threshold here. Training at the lactate threshold intensity is believed to be particularly effective at increasing the %VO2max at which the lactate threshold occurs i.e. allowing you race at a greater percentage of your maximum capacity (Sjodin et al., 1982; Neiss et al., 1992; Franch et al 1998; Carter et al., 1999). It also appears to be beneficial for improving exercise economy (Hopker et al., 2009; Franch et al., 1998;), the velocity at which the lactate threshold or maximum lactate steady state occurs (Enoksen et al., 2011; Philip et al., 2008; Billat et al., 2004; Evertsen et al., 2001), time to exhaustion at the maximum lactate steady state (Billat et al., 2004), may increase VO2max (Phillip et al., 2008; Billat et al., 2004) and improve exercise performance (Priest and Hagan, 1987). Research has shown that the inclusion of lactate threshold training, was more effective, than increasing training volume by 40% (50km to 70km), at increasing both the velocity at VO2max and the lactate threshold, in a group of male middle-distance runners (Enoksen et al., 2011). The time to exhaustion at the maximum lactate steady state (MLSS) was also significantly increased (from approximately 44 to 63minutes – >50% improvement) following 6 weeks of training at the MLSS in master endurance runners (Billat et al., 2004). Research in cyclists (Hopker et al., 2009), has found that gross efficiency in cyclists, was related to the amount of training time spent between the lactate threshold, and onset of blood lactate accumulation (OBLA). Lactate threshold training leads to improvements in: aerobic energy pathways, anaerobic energy pathways, the anaerobic threshold and sustainable % VO2max, time to exhaustion and lactate clearance. The lactate threshold is related to the % type I fibres (Coyle et al., 1991), mitochondrial aerobic enzyme activity (Coyle 1995), and also appears to be related to mitochondrial size and density, aerobic enzyme concentrations, muscle capillary density, and enhanced fatty acid metabolism. Since type I fibres have the greatest concentration of mitochondria it seems logical that training that leads to the greatest stimulation of type I fibres, and hence mitochondrial aerobic enzymes – the recruitment of type I muscle fibres reaches its peak at the lactate threshold – would be the best stimulation for increasing the LTVO2. Since training at an intensity around the lactate threshold, can be performed for much longer, and can make up a greater percentage of total training, with reduced physiological stress than training at 100%VO2max, this may be the optimum training intensity for raising levels of type I aerobic enzymes. Therefore, the use of lactate threshold training may serve as a compromise between volume and intensity (Weltman et al., 1990), allowing a greater training volume, at an increased intensity than moderate/easy training, but with a reduced risk of overtraining than is the case with high intensity interval training (HIIT sessions). One other important factor to consider with lactate threshold training is that there is a decreased risk of over training compared with HIIT sessions. The main reason for the reduced risk of overtraining, is due to the reduced levels of catecholamines (stress hormones) during tempo/lactate threshold training, compared with HIIT sessions. Although, there is a slight rise in the level of catecholamines at the point of the lactate threshold, the concentration of catecholamines rises sharply at intensities above the lactate threshold. Therefore, training at the lactate threshold is the optimum training intensity for improving aerobic fitness, lactate threshold, and exercise economy, whilst reducing the risk of overtraining associated with training at much higher intensities. Because the levels of catecholamines are much lower, when training at the lactate threshold, than at higher intensities, it allows you to complete a significantly greater percentage of training at the lactate threshold, than you could if training at higher intensities. One of the main effects of lactate threshold training can be seen in an improvement in the lactate profile. 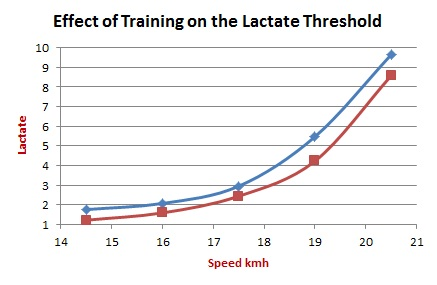 The graph on the left demonstrates the effect of training on the lactate threshold. Following a period of lactate threshold training there is a noticeable improvement in lactate levels at all speeds. In particular the speed at which the lactate threshold occurs (basically the point at which there is an acceleration in lactate production) has improved by approximately 0.5kmh which translates to significant improvements in endurance race performance. How much Lactate Threshold Training should you do? As with any type of training some individuals will respond differently to tempo training and the optimum level may vary slightly between individuals. Research suggests that optimum benefits occur when lactate threshold training makes up around 15-25% of total training volume (Bunc et al., 1989; Niess et al., 1992). Research into the training of elite runners, suggested that 25 minutes of lactate threshold training per week was the minimum duration required to elicit an effect in lactate threshold running speed (LTRS) with optimum improvements in LTRS when lactate threshold training comprised approximately 23% of all workouts (Niess et al., 1992). Typically this type of training is done as either one long effort (e.g. 20-30 minutes) or may be broken in to a series of smaller intervals (e.g. 3 x 10 minute tempos separated by 2-3 minute active recoveries). Generally longer continuous efforts would be performed at a slightly lower intensity/pace than lactate threshold intervals (e.g. 30 minute tempo completed at an intensity that could be sustained for 1 hour whereas the 10 minute intervals would be completed at an intensity that could be sustained for 30 minutes). The intensity or power output that can be sustained for 1 hour is often referred to as the functional threshold (particularly when relating to cycling) or functional threshold power – although it is very slightly below lactate threshold it is close enough to fall into the category of lactate threshold training and promotes the same training benefits. Example Lactate Threshold Training Session 4: 6 x 5 mins at an intensity sustainable for 30mins, separated by 60second active recoveries. The above image shows the heart rate response during a lactate threshold training session in which I completed 3 x 10 minute efforts at around lactate threshold intensity separated by 3 minutes recovery. During the 10 minute efforts heart rate was kept around 170-175bpm. The three minute recoveries were just sufficient to bring heart rate down to around 145-150bpm over the last minute of the recovery. The recovery intensity was aproximately 60% of the lactate threshold/tempo intensity. The above image shows the heart rate during a functional threshold power training session (FTP is the power sustainable for ~1hour) which is at an intensity that is slightly below the lactate threshold. The session involved 2 x 20 minutes @ FTP with 5 mins recovery @ ~60% of FTP. During the efforts the heart rate was approximately 3-5beats/min lower than during the 3x10minutes lactate threshold training session. Lactate threshold training involves completing prolonged training at intensities around the lactate threshold e.g. 1 x 30mins, or 3 x 10mins at the lactate threshold intensity. It is believed to increase the % of VO2max that can be sustained, enhances fatigue resistance and time to exhaustion at intensities around the LT, improves exercise economy, aerobic capacity and endurance race performance. Training at this intensity is believed to be the optimum intensity for the recruitment of type I muscle fibres (slow twitch) and may be the optimum intensity for raising levels of aerobic enzyme levels in type I muscle fibres. Tempo training presents a reduced risk of overtraining than high intensity interval training (HIIT). Tempo training sessions can therefore be longer and make up a greater total volume than high intensity interval training. Research suggests that optimum benefits appear to occur when lactate threshold training makes up around 15-25% of total training volume. Running Technique: Is changing from a heel first to a mid-foot running style beneficial?